Have the coolest devices to use for cooking, boiling water, blending your favourite fruits, making coffee, baking, and all other tasks. You can find a great range of cooking and frying pans on pg 28. High-quality, non-stick and very durable products are also looking cool and modern. 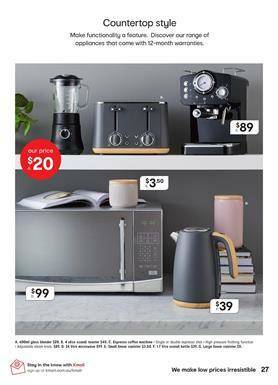 Black, like the furniture range of Kmart, is the colour of kitchenware and appliances in the last part of the Kmart Catalogue which is focused on home products. I love the prices, irresistible offers, metallic style, and futuristic design of each piece from this part of the new sale. Check out vacuum cleaners including bagless vacuum, stick vacuum, and others on pg 30 of the latest catalogue. Moreover, you can find something good for your pet in this catalogue. Pet beds, blankets, toys, and cleaning products are the featured items on pg 31. See mugs and bowls on the last page. Follow our Facebook page where you can see all the posts updated here.